The FSA Logistix team is led by the company founder, Chairman of the Board and CEO, Charlie Annett. The senior management group is well seasoned with decades of experience in the transportation, logistics and home delivery business. Collectively, the top 6 managers of FSA network have over 150 years of logistics and customer service experience. CLICK HERE to read more about the company history. 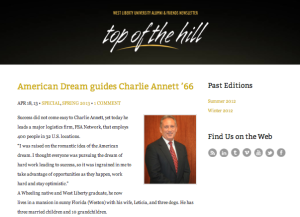 The West Liberty University Alumni and Friends Newsletter recently featured FSA Logistix CEO Charles Annett in their “Top of the Hill” publication. Click here to read the full article. 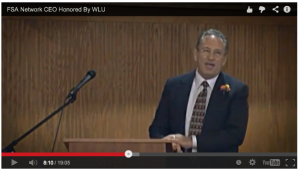 FSA Logistix CEO Charles Annett honored at WLU Alumni Ceremony. Click here to view highlights of the event.